Backlighting is perfectly executed on the Kobo Glo, and is a great option on a versatile e-reader that occasionally needs a computer. A versatile, customisable and highly portable e-reader that can be held in one hand, the Kobo Mini is cheap, but is it too limited? The Nook Simple Touch GlowLight packs a beautiful backlight and social options, but can it rival Amazon's Kindle Paperwhite? The Sumvision Cyclone Micro 3 is a portable media player that is so small it can fit in your shirt pocket. Amazon's touchscreen ebook reader offers tablet-style control with the same great E Ink screen, so is it worth the extra £20? 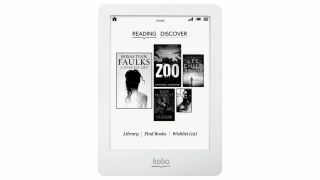 An ebook reader with a touch-screen interface and Wi-Fi connectivity aimed to compete directly with the Kindle.